Alfred John Martineau was an Ear, Nose & Throat surgeon, who became Commander of Newhaven Fort during the early years of the war, before going to France with the Royal Garrison Artillery, where he was killed by a sniper while engaged on observation duty. Alfred John Martineau was the stepson of Alfred Martineau (1820–1903), who was a Judge on the Sussex circuit. His mother was Maria Stephenson, née Chatterton (1838–1912), born at Newark in Nottinghamshire, whose father ran a tailoring business at Market Place, Newark. She married Alfred Martineau at St Pancras Registry Office on 12 January 1877, by which time she was widowed with four children, of which 4 year old Alfred John was the youngest. The Martineau family were descended from Gaston Martineau, a Huguenot refugee who fled France in 1685. Alfred Martineau’s father, Philip (1791–1860), was a solicitor and taxing master to the Court of Chancery; his brother was Robert Braithwaite Martineau (1826–1869), the artist. After the marriage, the family lived at Fairlight Lodge, near Hastings in Sussex. Fairlight is the highest point on the coast between Beachy Head to the west and Hythe, Kent to the east. Fairlight Lodge stands at the corner of Martineau Lane, named after the family. In the spring of 1900, Alfred John married Emma Louisa Williams (1872–1951) at St George’s, Hanover Square, London. She had been born in Bristol, the daughter of Thomas Howell Williams, a traveller in printing. The couple appear to have had no children. Alfred was educated at University College School, Hampstead between 1882 and 1890, before training at the St Thomas’s Hospital Medical School where he obtained the M.R.C.S. (Membership of the Royal College of Surgeons) and L.R.C.P. (Licentiate of the Royal College of Physicians) in 1895, followed by the F.R.C.S. Edin. (Fellowship of the Royal College of Surgeons of Edinburgh) in 1899. After a time as house-surgeon at St Thomas’ Hospital, and at the Hospital for Sick Children, Great Ormond Street, and as house-physician to the Brompton Chest Hospital, he was appointed Senior Resident Medical Officer at Nottingham General Hospital in 1899. After his marriage in 1900, he moved to Hove in Sussex, where he set up in general practice as well as being a surgeon at the Brighton Ear and Throat Hospital. Alfred Martineau was one of three brethren who were initiated into Royal Clarence Lodge No 271 at Brighton on 8 December 1913, the others being Barron Lycett (who died in March 1919), and Charles Burt Brill, a solicitor. The three men were passed together to the second degree on 20 February 1914, but raised to the degree of a master mason at successive meetings, with Alfred Martineau being raised on 17 April. 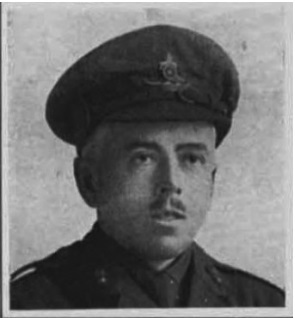 On 1 August 1906, Alfred enrolled as a volunteer in the 1st (Brighton) Company of the Sussex Territorial Royal Garrison Artillery with the rank of 2nd Lieutenant, and was promoted to Lieutenant on 12 August 1907 and again to Captain on 11 March 1911. Following the outbreak of the war, he was promoted to the rank of Major and took command of the company. He was posted to Newhaven where he was in command of the fort until November 1915. From December 1915, he was with the 69th Siege Battery as they trained at the R.G.A. depot at Lydd in Kent, where they had their first experience of modern 6 inch guns and railway mounted equipment, with firing practice on 8 inch muzzle-loading howitzers. The battery remained at Lydd until February 1916, waiting delivery of their own guns. By the end of February, the battery were at Taunton in Somerset, with Major Alfred Martineau being second in command under Major Harrie Gardener Carr. At this time, approximately half the battery were Sussex R.G.A. Territorials, with the remainder being regular soldiers, including Major Carr. On 17 April, the guns left Boulogne by rail, while the battery travelled by lorry, arriving at Albert in the Somme valley on 19 April, where they were attached to the 27th Heavy Artillery Group, as part of the 3rd Corps, 4th Army. By the end of April, the battery was installed to the north-west of Albert, with the men stationed at Dernancourt. The first test firing was on 10 May, when 18 rounds were fired at a range of 7000 yards. Regular firing on the enemy trenches commenced on 24 May, following which the battery built up the intensity of fire until by the end of June, they were firing over 400 rounds a day in preparation for the assault planned for the end of the month. On 27 June, a shell burst prematurely, sadly killing two men and seriously injuring six others. As the infantry started their assault on 1 July, the battery launched their bombardment on the enemy lines at Ovillers, about 6km away. As July progressed, and the infantry gradually forced the enemy backwards, the guns were moved east to bombard Pozieres and Courcelette. By the end of August, the guns were at Contalmaison, from where they continued to support the infantry as they launched their attempt to capture High Wood, near the village of Martinpuich. On 11 September 1916, Alfred was posted to take command of the 19th Siege Battery based at Mametz, a few kilometres south. This battery were equipped with four 8″ Mk. VI B.L. Howitzers. Over the next few months, the battery was gradually moved forward so that, by early February, they had gained 12km and were at Feuillères, on the banks of the River Somme. In February, the 19th Siege Battery were transferred to the 30th HAG, and ordered to move 60km north to Gouy-Servins, from where they bombarded the enemy entrenchments on top of the ridge near Vimy. At the end of March, they were on the move again, when they joined the 79th HAG, a few kilometres north at Bouvigny-Boyeffles, 12km west of Lens. On 17 April 1917, Major Alfred Martineau was killed by a sniper when reconnoitring for new observation posts in the Bois de Riaumont, near Liévin. He was forward in an advanced post in a wood recently captured from the enemy, and was shot by a sniper while engaged on observation duty. The bullet passed through his brain and death was instantaneous. Immediately after, the enemy raided the wood making it impossible to recover the major’s body until today, when we managed to bring him in after the enemy had retired. Apparently, the enemy carried away his binoculars but, as far as I can tell, all the rest of his private belongings are complete and will be forwarded to you along with his kit. The Major was a keen and able artillery officer, and his place will not be easily filled. He was absolutely fearless, and cared nothing for shellfire or any other form of danger. He had been with us nearly eight months, and it is no exaggeration to say that everyone in the battery adored him. He was a father to us all, as well as a commander. His death has come as a great blow to us, and it is difficult, indeed, to realize that he is no longer with us. His death was reported in The Sussex Daily News of 30 April 1917, which described him as “An exceedingly keen soldier, and a very able artillerist, he was greatly respected by his officers and men”. I learnt the news that one of our best liked Officers of pre-war days, a Major Martineau, who in happier days had been a leading surgeon at the Children’s Throat and Ear hospital in Upper Church Street, Brighton, had been killed in France while marking the fall of shot of a German battery. A Great Loss. He was buried at the Bully-Grenay Communal Cemetery, British Extension, at Bully-les-Mines, Pas de Calais approximately 7 kilometres north-west of where he was killed. He is commemorated on the Masonic Roll of Honour and on the War Memorial at Hove Library. He was awarded the British War Medal and the Victory Medal. James Eadie Davidson was subsequently promoted to Major, was Mentioned in Despatches and awarded the Distinguished Service Order (DSO), the Order of the Crown (Belgium) and the Croix de Guerre (Belgium). Sadly, he too was killed, aged 25, less than a month before the end of the war, near Peronne on 16 October 1918. Alfred’s widow, Emma, did not re-marry and died at Brighton on 11 July 1951, aged 79. WO 374/46519: Major Alfred John Martineau. Royal Garrison Artillery.